Explain the basic rules and why we have them. Is it fair to break the rules? The rules of basketball are important. They keep the game safe and fun. If you play outside the rules, you or someone else may get hurt, and they may try to retaliate and hurt you. Plus, even if you get away with breaking rules, it is not much fun to succeed or win by breaking the rules. It’s important in basketball and in the rest of life to follow the rules. 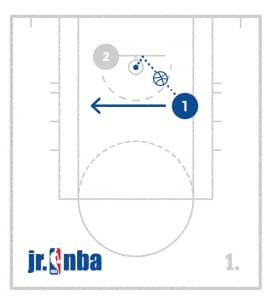 Have the players start in two lines in opposite corners where the baseline and sideline meet. Place cones every 5-10 feet apart at opposite angles from each other. 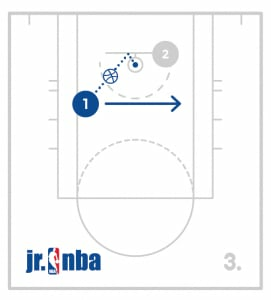 The players will start by dribbling from the starting point to the first cone. 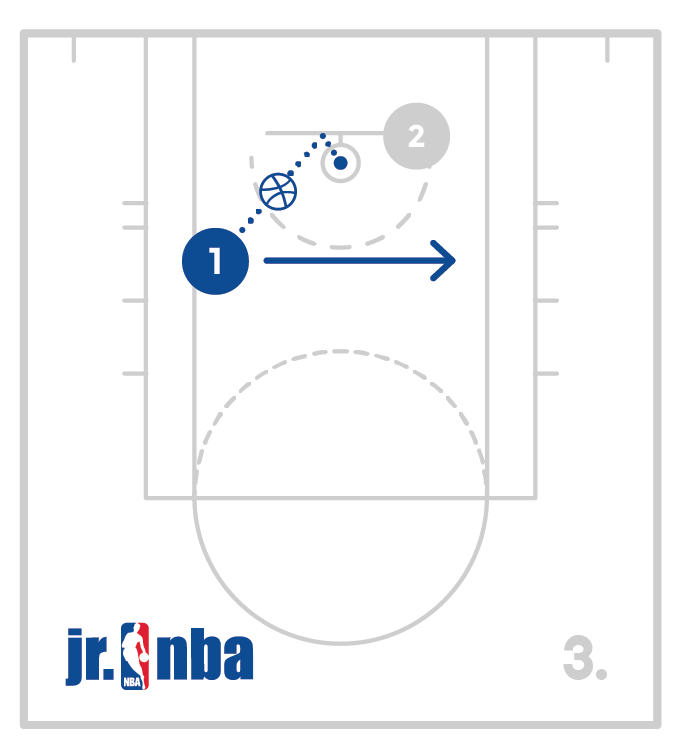 At the first cone, the players will make a move you have designated (Rookie Level-crossover) and continue to the next cone. The players will again make the move you have designated and continue to the next cones and continue the process. When the players finish, they should dribble along the baseline and begin the same process coming back in the opposite direction. This drill allows the players to work on changing directions and making a moving crossover. Make sure the players stay low on the crossover and push off their outside foot to change directions. Using the backboard can be helpful in many situations. If you watch an NBA game you will see the players use the backboard often to help make certain shots easier. When using the backboard it is important to aim for the square! Divide the players into groups and Place five cones in the shape of a “V” – 1 cone, 2 cones, 2 cones. 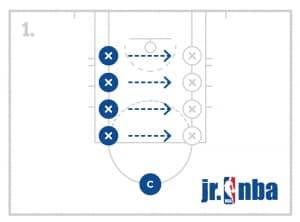 Have the players start at the bottom of the V.
The first will jump with two feet from the bottom cone to the next cone and then zig zag jump forward with two feet until the last cone. After this, the player goes to the back of the line for that group and the next player begins jumping. Make sure the players have good body control and balance as they jump. As they get better have them try to perform the drill quicker. Have the players spread out on the court in front of the coach. After 30 seconds, let the players rest and do it again. Make sure the players have a lot of energy and enjoy this. Also ensure they have good form in the defensive stance. 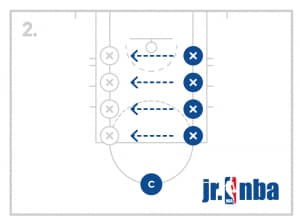 Have the players line up on the lane line and face the coach. 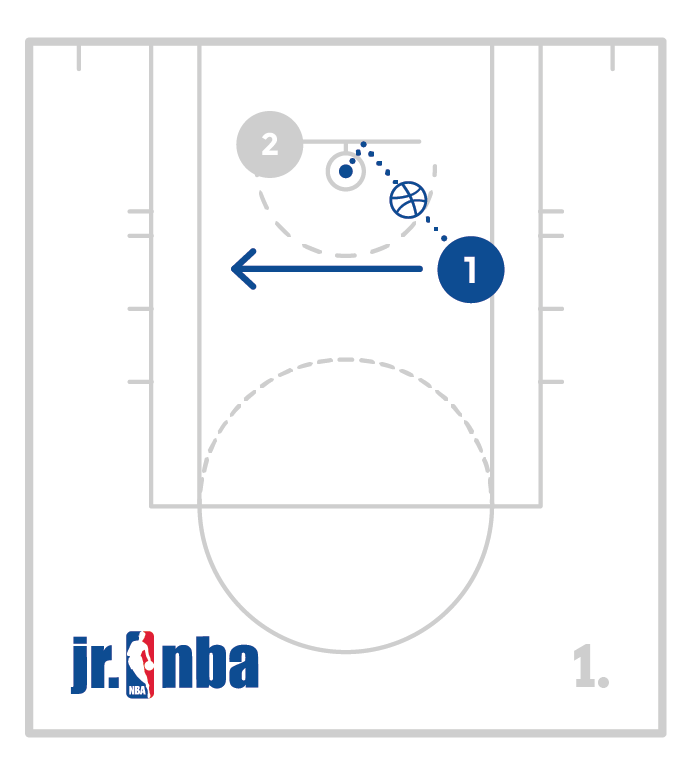 When the coach says “go,” the players should push off their back foot to slide to the other side of the lane where they will plant and push back. The players will continue this process for 15 seconds. Make sure the players stay in a good stance with their chest and eyes up. Have them work on changing directions quickly and pushing off their back foot. One team will have basketballs and will dribble around the court. 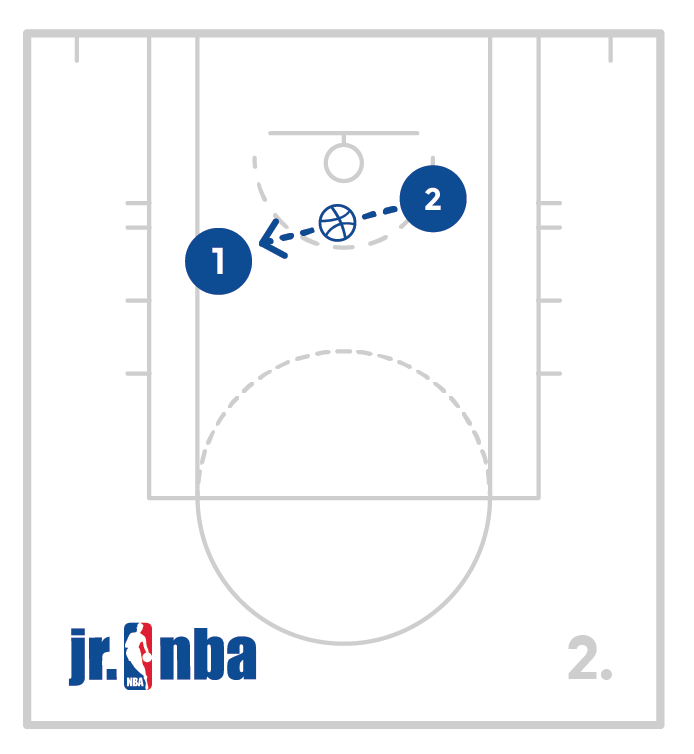 The other team will move around waiting on the coach to call “Swipers”. When the coach says “Swipers” the team without the basketballs can go try to knock the ball away from players with the basketballs. If the ball gets knocked away from a player, they must go get the ball and put it over their head. If a teammate with a ball rolls their ball between their teammates legs, it allows the teammate to begin dribbling again. The game should last two minutes before switching teams. There should be no contact between players in this game. Swipers can only touch the ball.